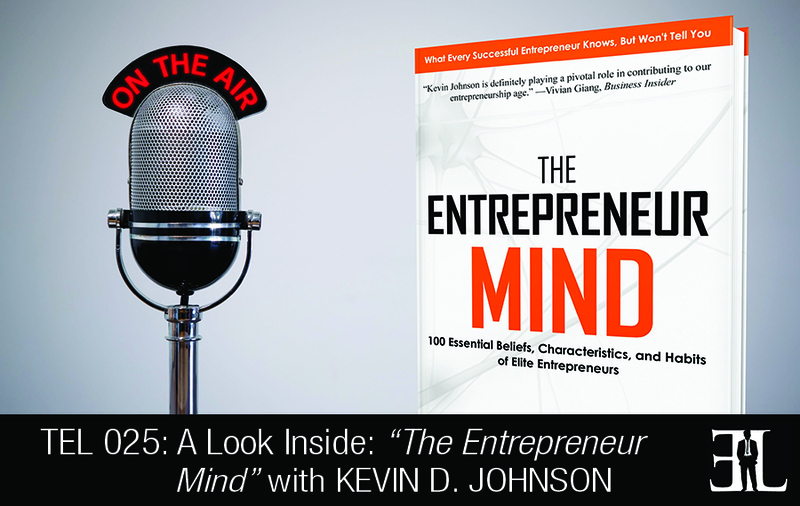 In this episode Kevin D Johnson shares his book The Entrepreneur Mind. This book is perfect for the entrepreneur who needs tips on business strategy, finance, marketing, and sales. The Entrepreneur Mind is written in the format compared to a blog and can be read in an easy, non-technical way by using creative stories that entertain and teach at the same time. The readers told me what they liked and through them I learned that it was my writing style that set it apart from others. My writing style for business books has two major goals; to be very accessible and appealing to even the reader who may not be interested in business and the second goal is to not be so technical so as to turn off the reader. I do this by using creative stories that entertain and teach at the same time. It really depends on how busy you are. I always encourage people to look at a book to see what’s most valuable if you are really busy and the book is written in a format that allows you to jump in and jump out. The segments are anywhere between 500-700 words so that you can read very quickly something that peaks your interest. If you have some time you can certainly read the book straight through. The most valuable part of the book is the part that encourages entrepreneurs to create new markets that will be well worth your time and much more profitable. The book is divided in to seven different sections; strategy, education, people, finance, marketing and sales, leadership and the final section is motivation. I divided the book in to these seven sections to make it a little bit easier to follow along. A lot of the content was originally in the format of that of a blog and so the book is just a little more structured. Strategy by far is the largest and most important chapter of the book and it starts off with motivation to think big. If you are going to be an entrepreneur you might as well go after the big ideas because you are going to be doing a lot of work and spending a lot of time investing a lot of resources in to your company and ideas. Another popular section in the strategy chapter is to create new markets. I talk about that often because those entrepreneurs that are able to identify new markets are ultimately the most profitable and most successful. The business plan is overrated. A lot of people really appreciate my perspective on that in telling entrepreneurs that you have got to get out there and test the market and make sure that the idea will actually sell. Chapter two talks about education and gets a lot of feedback. I talk about how school is not necessarily education. It’s not necessarily what you learn in class but the opportunity that you take advantage of while you’re there on a college campus. One of the great examples is that of Mark Zuckerberg. I talk a little bit more about education in terms of not rushing to get an MBA. So often I think a lot of entrepreneurs think that getting an MBA will really help them and of course it helps but I think what really helps a true entrepreneur is actually getting out there and trying to make a business work. There is no better experience than getting out there, starting your own business, and doing it yourself. Chapter three talks about people, you’re going to need very supportive and helpful people to make you be successful. There are very few solo entrepreneurs that reach the heights of those that have a strong team around them. I talk about how and why it’s very important to spend the majority of your time with people smarter than you. A lot of people tend to find people or organizations that they are comfortable with and in order for you to grow you have to step out of your comfort zone and spend more time with others that are smarter than you. I also talk about how it’s so important to get the right mentor. Another important idea in this chapter is regarding how you manage people by managing expectations. A lot of people will say that you can’t manage people and I agree with that. So the best way to do that is to manage expectations. And finally for chapter three, I talk about firing unproductive people. I tell you how to do that and how to improve your firing process. Chapter four is about finance and one of the biggest misconceptions about entrepreneurship is this idea that you need money to make money. I think the younger generation has done a good job at proving that that is not the case. This part of the chapter talks about finding all the resources that you can use to get your business off the ground for very little money. I also talk about some banking opportunities and managing debt well. Chapter five is about marketing and sales. It is one of my favorites and very important. I start off this chapter by talking about you’re in sales whether you want to be or not. It talks about how you need to find your way of selling; everyone doesn’t sell the same way. Another part of the marketing and sales chapter is making sure you’re asking the clients the right questions. Once piece that has really helped our business is we focus on asking open ended questions and that way we learn a lot about our customers that otherwise they may not tell us if we ask them a close ended question. I talk about building your network creatively. We talk a lot about networking but you’ve really got to know how to network creatively to be most effective. Chapter six is about leadership and it talks about a lot of the characteristics and habits that great leaders have. This is a really important chapter that talks about fear for example and how to overcome the fear in leadership. Chapter seven is about motivation and talks about how being successful is not the goal. A lot of the most successful entrepreneurs are trying to solve a problem or bring value to the market. We talk about what your proper motivations should be in pursuing a business. I am the CEO of Johnson Media Inc. a marketing and communication firm that has been around for about 14 years now. We serve primarily organizations and fortune 500 companies in the financial services space. We are based in Atlanta and a rather small team with big clients. In March of 2012 I started a business blog that discussed various ways that successful entrepreneurs think and the blog became pretty popular to readers all around the world. Before long I was really encouraged by some of my readers to write this book because it quickly, because of the response before, became a bestseller. I wanted to provide a comprehensive body of work and advice for the many people that I mentor and ultimately publishing the book and extending the entrepreneur mind brand in other areas seemed like a great way to teach entrepreneurial concepts.